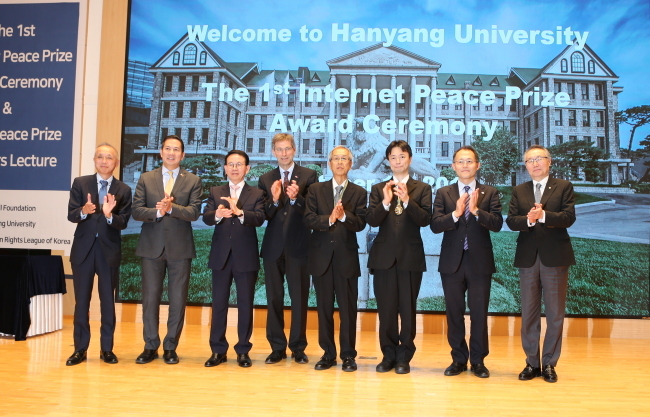 Japanese anti-hate speech organization the Kawasaki Network of Citizens Against Hate Speech and Japanese online activist Ken Ogiso have been awarded the 2018 Internet Peace Prize of the Promotion of Peace on the Internet in a ceremony Thursday at Hanyang University, attended by some 200 participants including Nobel Peace Prize Laureates, ambassadors and students. The Sunfull Internet Movement, the Korean nongovernmental organization, has recognized the anti-hate speech group and the online activist for their work to stop hate speech, racism and the violation of human rights via the internet and spread online etiquette by giving lectures to the general public, respectively. The winners will take home medals, certificates and prize money. Min Byoung-chul, a professor at Hanyang University and founder of the Sunfull Internet Peace Movement, established the annual prize for individuals and organizations that make significant contributions to human rights and world peace via the internet. The 2018 recipients were the first winners of the award since its establishment. The Kawasaki Network of Citizens Against Hate Speech, which comprises 156 human rights organizations, has been monitoring hate speech on social media and conducting lectures to educate people about the seriousness of the problem since 2016 to end discrimination against foreigners and minorities in Japan. The group also organized demonstrations with more than 1,000 participants to protest hate speech. “It’s an honor to receive the Internet Peace prize. As South Korea and Japan have close historical connections, hate speech can have a big effect especially between two countries. Therefore, we believe it’d be crucial to eliminate hate speech (through our endeavors,)” Yamada Takao, director of the group said in an interview with The Korea Herald. The other recipients, Ken Ogiso, has conducted more than 2,000 lectures on the online etiquette and communication ethics for the prevention of violence on the internet to more than 400,000 Internet users in Japan in a bid to stop the online violence. “The internet may be very beneficial, but it is extremely important that you do not make you and other people’s lives miserable, by writing groundless malicious comments. We will continue to educate people on the importance of creating polite internet culture,” Ogiso said on an acceptance speech. “With the efforts of the Kawasaki Citizens Network and Mr. Ogiso, I hope that the use of hateful language will be replaced by beautiful language, contributing to peace for individuals and also peace between our nations, bringing us a step closer to humanitarian peace,” Min said on greeting remarks, congratulating the recipients.